Update on Jan 23, 2012 – Some WMSCOG members claim that this court case is one in a series of court cases involving the WMSCOG and Ji Won Tak. WMSCOG members claim that a later court overturned this court’s ruling. When I have obtained the additional court cases, I will post them here. Legal Counsel, Kyung Yong Park, esq. Co-counsel, Yong Gi Ryu, esq. Legal Counsel, Gi Joon Park, esq. 1. The claims by plaintiff are all dismissed. 2. Plaintiff shall pay for all legal costs. Claims Plaintiff seeks defendant to pay plaintiff 20,000,000 won and interest calculated by 5% a year for the period from the day after this copy of lawsuit was delivered and until the judgment date and 20% a year from the following day until entire amount is paid. 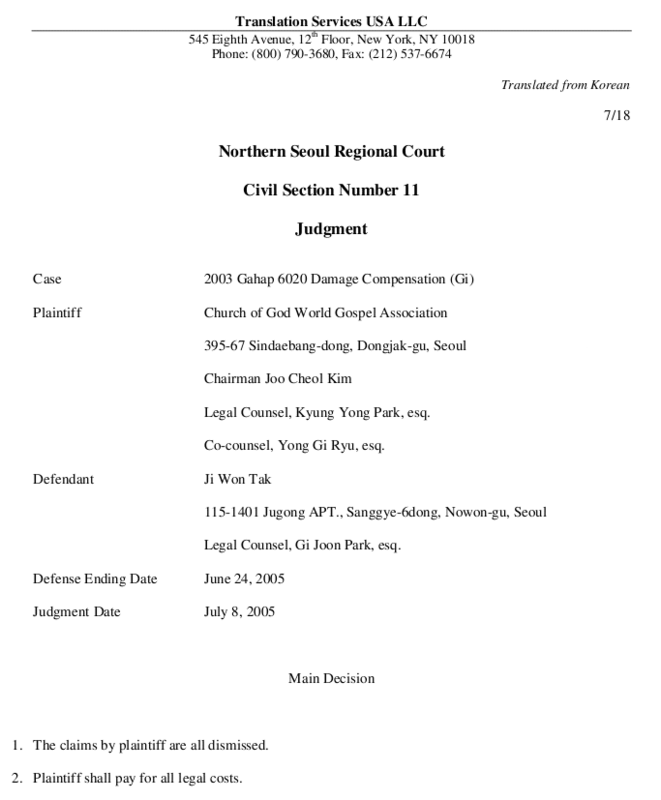 Plaintiff seeks defendant to designate a newspaper among the papers published and distributed nationwide within ten days of the final decision and post a correction at the bottom of the page with 38 font size in gothic font with a title of correction and an article underneath with a 14 font size in (myungjo) font at the expense of defendant. The following facts are undisputed by the parties, or can be acknowledged as facts by concluding from all of the intentions in the arguments listed in the evidence (Article) numbers 1 through 3. “plaintiff church” hereinafter), and defendant is the publisher and editor of the monthly magazine (Hyudae Jongyo). C. As such, the plaintiff church claimed that the defendant published untruthful facts about the plaintiff church which resulted in damage to their reputation and honor by which it filed an injunction on producing, selling, and distributing published materials, followed by a libel and slander by publication lawsuit against the defendant around June, 2002. All of the contents of the book about the plaintiff church describe untruthful facts, by which the plaintiff church’s reputation has been damaged due to such illegal acts committed by the defendant against the plaintiff, therefore the defendant must pay for the damages and is obligated to publish an appropriate correction in a newspaper in order to recover the damaged reputation as listed in the attachment. (1) First of all, we shall take a look at the book (referred to as “the book in this case” hereinafter) about the plaintiff, published by the defendant, and decide if the contents were describing all untruthful facts. (A) In looking at page 145 of the book in this case in which the defendant states that the, “church rejects the Christian doctrines,” and proclaims, “they are not Christians,” according to the combined arguments made in the evidence documents 1 and 2 of (Article) number 3, (Article) numbers 4 and 5, 4 of (Article) number 7, and 1 and 2 of (Article) number 19, the plaintiff church does indicate the church leader Sang Hong Ahn as the holy God or the reborn Jesus Christ in their doctrines, dogma and in one of their hymns, “New Song”, and Gil Ja Chang as the Mother God. Also as described later, they did insist on their end of the world theories, not to mention the church officials having described their religion as “God’s church different from the Catholic church and with different characteristics from many protestant churches as well.” They also stated, “we would like to be understood and accepted as a new religion and not as another denomination of the existing protestant church.” Considering these acknowledged facts and statements, it can be interpreted that they in fact were rejecting the basic Christian doctrines from the point of Christianity, therefore, it can only be said that these were not untruthful facts. in their programs of “60 Minutes America”, “Cases and People”, and “PD Memos” respectively, and there is now an organization formed by husbands of the victims who have said that they were victimized by the plaintiff church’s end of the world theory. Considering all these acknowledged facts, it cannot be conclusively said that the book’s descriptions are untruthful facts even if there may be some incorrect or a little excessive expressions about how the end of the world theory was described. (C) In looking at the parts where it said the plaintiff church changed its name to the Church of God World Gospel Association because of how their end of the world theory did not materialize or the critical opinion from the society, and it changed its name to the Church of God from Sang Hong Ahn Witness Association because its name didn’t fit well with their missionary attempts, according to the combined arguments made in the documents and videos of (Article) numbers 5 and 7 (including serial numbers), the plaintiff church in fact has been using its title of Sang Hong Ahn Witness Association or the Church of God short for the Church of God Sang Hong Ahn Witness Association since the death of Sang Hong Ahn in 1985, and around 1997, it established a non-profit organization titled the Church of God World Gospel Association for the purpose of registering and managing the organization’s assets. Additionally, as described earlier, it did in fact proclaim the end of the world theory which resulted in critical opinion from the society – which was all true, and it seems that the plaintiff church does most of its external activities in the name of Church of God World Gospel Association, not to mention the fact that it almost does not use the Sang Hong Ahn Witness Association name when it does missionary work. Therefore considering all of these actual facts, it cannot be concluded that what the defendant described about these parts are all not true. she was spiritual mother, and after the death of Sang Hong Ahn, the church was indeed divided into the New Covenant Passover Church of God based in Busan and the plaintiff church based in Seoul which was the result of these two sects’ argument over making Gil Ja Chang the spiritual mother. Therefore, the book’s descriptions about these parts cannot be concluded as untruthful facts. (E) In looking at the parts about the life of Sang Hong Ahn and worship rituals such as requiring to take off shoes, according to the combined arguments made in documents 4 of (Article) number 20 and (Article) numbers 5 and 15, these descriptions were based on an article published in the December 1985 issue of (Hyundae Jongyo) which was written by the magazine’s reporter, Chung Kim, who actually visited the plaintiff church to experience the church and did interviews. 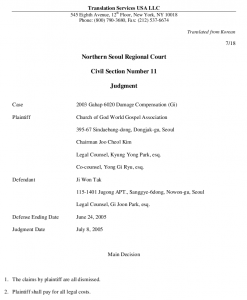 Therefore it cannot be concluded that these were untrue, or that the defendant wrote it thinking it was all untrue, and furthermore, it cannot be concluded that the descriptions about the life of Sang Hong Ahn and the worship rituals damaged the plaintiff church’s social reputation. (F) In looking at the church’s own interpretation about the doctrines, according to the arguments made in documents 1 and 2 of (Article) number 17, it is true that there is no mention of seven horns symbolizing seven seasonal periods in the book Sang Hon Ahn wrote titled, “The Mystery of God and the Spring of the Water of Life”, but the book indeed mentions about “David’s horns” and “the little lamb during the last period”, and additionally, the above descriptions are based on the July and August 1994 issues of the Seventh Day Adventist Church’s magazine (Mokyangja). Therefore, the above parts about the doctrine and the following mentioning of cult and heresy seem to be opinions by defendant on the plaintiff church’s doctrines, cults and heresies from the defendant’s point of view. Considering these points, it cannot be concluded that these descriptions are untruthful facts either. Gidok Sinmun (Christian Newspaper) and testimony by In Ja Chung. Even though the newspaper later replied to the article, it was only a reply made by the newspaper and cannot be interpreted as the newspaper admitting the article as untrue or having errors, and furthermore, in the summary order related to the above article (Seoul Regional Court Northern Branch 2000 Goyak No. 22814), it was acknowledged that some 300 members of the plaintiff church disrupted business in front of In Ja Chung’s video rental store and some of the members and In Ja Chung engaged in altercations which resulted in an indictment. Therefore these parts also cannot be concluded as describing truthful facts. (H) In so far it has been looked into, the contents of the book in this case, published by the defendant, may have some parts where its expressions were not entirely correct or a little excessive, and it can be said especially from the plaintiff church’s point of view that there are parts where misunderstanding can result from how one interprets them, but in looking at the overall picture of the book, the main contents of the book do match with actual objective facts, therefore it is hard to determine that the contents are untrue, and furthermore, even if some of the details do not match with the objective facts, the defendant wrote the book based on the combination of studying the various doctrines and books published by the plaintiff church, the research data of the defendant’s father, Myung Hwan Tak (deceased), articles written by the reporters of the publishing house that the defendant operates who visited the plaintiff church and collected data, reports of various newspapers and broadcasting stations, testimonies by pastors and members who were once members of the plaintiff church and later left, as well as individual tips the plaintiff church and outcome of consultations with victims of the church, and considering all of how the book in this case was written, it is reasonably believed that the defendant believed what he found out to be true and there is no evidence that proves the defendant otherwise recognized them to be untrue. books, contents, characteristics, expressions and methods, and the range of audience for the publication, it can be said that the plaintiff church was attacked for its characteristics of being a cult by the defendant in terms of its doctrines, therefore its degree of libel and slander is not comparatively significant. Moreover, considering how cults in today’s society have so many negative effects, the way how the defendant inappropriately and excessively described and severely and harshly criticized the plaintiff church in the book cannot be said as out of the range of expressing religious criticism in principle. Therefore, it is concluded that there is no ground for any illegality by the defendant and the defendant is not liable for committing any illegal acts to the plaintiff. In conclusion, the claims made by the plaintiff based on accusations against the defendant’s illegal acts against the plaintiff church, have no ground to be sustained. Therefore, the claims by the plaintiff are hereby all dismissed and the decision is made as stated in the main decision. This is an original copy. Regional Court (civil cases department). Oh, those dastardly book writers spreading lies about the poor, defenseless COGs! I assume that they claimed that the court was led by unbelievers, thus why they lost the case, right? God would never lose a court case I don’t care who is presiding over it. well you bring up a good point. why would “God” sue anyone? or better yet.. wouldn’t Zhang just call them and say “we’re going to lose, don’t bother”? How did u even get the legal papers? who are you anyway that you can access to all this things? Only judges and lawyers can get it, it can’t be disclose to public? Are you saying that court filings are not matters of public record in S. Korea? A simple Google search reveals that they are. This website provides a sampling of S. Korean cases and decisions that have been translated into English and published. Are you ok? Why do you feel the need to grab at straws? It goes to show you, [MR. JUST THINK ABT IT] just how sneaky your pals are. After Ahn died, the Sang Hong Ahn Witness Association was divided into a sect called New Covenant Passover Church of God that worshipped Um as the wife of God and another sect that chose Gil Ja Chang as the wife of God in 1981 and believed the second spiritual wife as Mother. So… Ash didn’t die in 1985? This does not become misinformation just because you say so. This website is not making up anything but just posting the case details. If you insist on burying your head in the sand, that’s your decision. Don’t tell others that they too should bury their heads. Regarding slander, I don’t think your church comes anywhere close to the amount of slander targeting other churches like the Catholic Church, which is a target of continuous slander from your church. So your so-called “profersized” points to the Catholic Church as the true church. No? Was this overruled by a case in 2006? Please be honest about this.